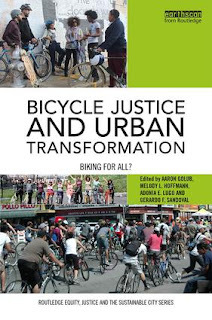 This summer, Routledge released Bicycle Justice and Urban Transformation: Biking for All? The book's 18 essays explore marginalized communities and bicycle advocacy, planning, and policy. The editorial team consists of Aaron Golub (Portland State University), Melody Hoffmann (Anoka-Ramsey Community College and author of her own recent book, Bike Lanes Are White Lanes), me, and Gerardo Sandoval (University of Oregon). A little less than two years ago, editors Stephen Zavestoski and Julian Agyeman published a collection of essays called Incomplete Streets. The book argued that the “complete streets” policy and design trend could benefit from an environmental justice approach to social inclusion. It was right up my alley because at the time, in my day job as Equity Initiative Manager at the League of American Bicyclists, I felt caught in a gulf between the bike movement I’d been part of for years and the transportation justice field that had inspired me to work on race and sustainable transportation in the first place. Practitioners in transportation justice, which has roots in the 1964 Civil Rights Act that made it illegal for federal funds to be distributed in a way that led to racial discrimination, tend to focus on public transit systems. Before I got into bike activism I’d been a member of Los Angeles’ Bus Riders Union, a groundbreaking grassroots effort that has for decades made the case that transit systems like Metro need to do a better job of serving their majority people of color and low-income users. I thought that because I was aware that the bike advocacy world did not match the diversity of who actually rides, other people working in transportation knew about this gap too. But when I brought up bicycling in transportation justice circles, I was told to take my shilling for a white man’s pastime elsewhere. I could see why bicycling seemed beside the point. For many families, bicycling for transportation is something that you work hard to get away from, rather than a desirable end in itself. When people have a hard enough time even gaining access to driver's licenses and dealing with the issue of tickets turning into debt, I can see why owning a car is still central to civil rights projects. I’d moved to D.C. because I thought that building a racially inclusive bike movement would help transform the symbolism of bicycling, making it something more positive for more people. But instead I grew to feel invisible within my own movement, where it was controversial to simply state that infrastructure couldn’t fix the vulnerability that different people face in our unequal streets. When I learned that Zavestoski and Agyeman were also on the editorial team for Routledge's series on Equity, Justice and the Sustainable City and they wanted to include a book specifically about bicycling, I signed on to be an editor of what became Bicycle Justice and Urban Transformation. Our introduction explains the gap between transportation justice and bicycle advocacy, and how this gap contributes to the public’s association of bike infrastructure with gentrification. We make the case that situating bicycling within a transportation justice framework will require addressing the blind spots of what we call “organized bicycling.” To get away from the dehumanizing term “invisible cyclist,” we argue that most bicycling takes place outside of the advocacy movement and planning efforts to promote it. 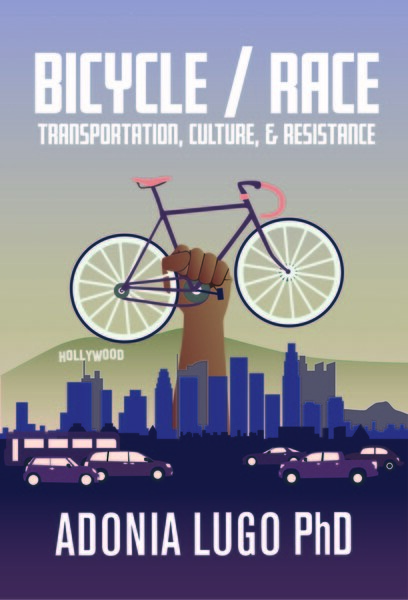 Differentiating bicycling in general from “organized bicycling” provides an alternative to othering people of color and/or low-income bicycle users. Then the project becomes expanding organized bicycling to encompass more kinds of users, rather than putting the onus on those users to make themselves visible to organized bicycling. In the second chapter, co-editor and transportation justice scholar Aaron Golub goes more in-depth about whether bicycling can be a civil rights issue. Since it’s the first book to define bicycle justice, the collection goes in a lot of directions from there. The common thread (besides bicycling) is that we asked our authors to present solutions that would make sense for practitioners. “No hay peor lucha que la que no se hace: Re-Negotiating Cycling in a Latino Community” by Martha Moore-Monroy, Ada M. Wilkinson-Lee, Donna Lewandowski, and Alexandra M. Armenta. My chapter in the book chronicles the othering that I experienced while working in bicycle advocacy at the national level and suggests directions for changing the movement’s agenda to include more people’s perspectives. Bicycle Justice and Urban Transformation is a first step toward creating an interdisciplinary conversation about bicycling and inequality. I hope it can be a resource for students, scholars, and practitioners alike. Thanks again to all our authors who made it possible to get the collection out there on a really short timeline!